We just put out boxes of beautiful wooden puzzles and items from Hape. The new mini plane and truck is adorable, and the toaster and pita set are wonderful. But my favorite is the “Melodies Pound and Tap Bench”. 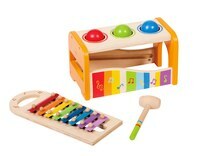 It encourages fine and gross motor skills and helps children understand cause and effect. Here are the photos. Took a few days to get them. The items are a hit! We just received a large shipment of sticky mosaics. They are as cute as ever! Two items that need mention are the Pirate Chest and the Crystal Clutch. 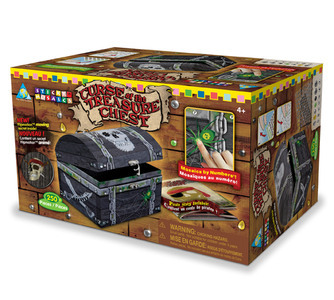 The Pirate Chest has 250 mosaic pieces to adorn the chest. There is a real working lock on the chest and a secret compartment. The Clutch has a zipper and handle for carrying, and comes with 550 shimmering jewel pieces with which to decorate. Stay tuned for pictures…the website is down. 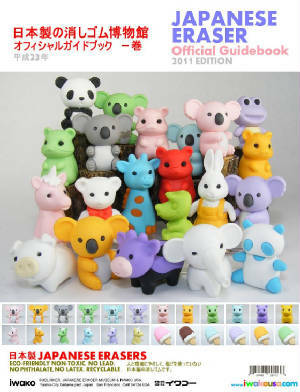 At long last, a new shipment of the Japanese erasers has arrived! There’s a new colored hamster, bunnies for Easter, a dino hatching from an egg, a unicorn, and others. Come see them! Do you know a very fashionable little girl? If so, we have the perfect new item for her! Purse switchables! You choose one of three base purses, then collect multiple covers so your little fashionista can mix and match as often as she wants! Check out just a few of the many styles below! We are infested with bugs….NANO BUGS, that is! These glow in the dark little creatures zip around like real bugs. They can move around the floor or in their nano habitat.